This post has been jointly drafted by Amandine Van Zuylen, Antoine De Spiegelaar, Victor Leblanc, Kevin Xhebexhia, Germain Haumont and Arnaud Picqué, all students in third year (BAC 3) registered for my course Intellectual Property Law at the Université Saint-Louis, Brussels. The requirements for this course include some online exercises on intellectual property topics. This post was jointly prepared after the students attended a theater performance, called ‘Un faible degré d’originalité’ (Théâtre des Tanneurs, 22 – 26.11.2016, Brussels). If you understand French, I advise you to attend this lively and instructive show on the history of copyright, and on some behind the scene stories which have shaped copyright rules over the last two centuries. Here is what the students found about some of the stories linked to copyright law. Between a play and a conference, « Un faible degré d’originalité » has the tone of a fun evening conversation with friends. This performance by Antoine Defoort highlights the origin and the evolution of copyright law since its official recognition at the end of the 18th century. It also encourages us to reflect on the justification of copyright and how the institution has been hi-jacked by some particular – if not personal – interests. In this performance, or, as Antoine Defoort prefers to call it, this “hiking”, he skillfully attempts to walk us through the tortuous paths of the large mountain that is Copyright Law. With the use of some cardboard boxes, a simple thread that quickly becomes a timeline, cookies and some drawings, Antoine Defoort illustrates his explanations with a great number of anecdotes, cultural references and real cases, making it easier for his audience to understand his disquisitions. Starting with the history of the three hundred years old institution that is copyright (in England, it started with the 1709 Statute of Ann; in France, “le droit d’auteur” was invented during the French revolution), he depicts the philosophical process that gave birth to it. He restates the importance of the remuneration of the authors to stimulate the creativity that is essential to society’s development. And the importance of the recognition of authorship to give authors the exclusive right of attribution for their work. These two founding ideas gave birth to the two cornerstones of author’s rights. The first components of author’s rights, he explains, are the moral rights; they modulate the artist’s relationship with his work and indefinitely protect it from any kind of distortions or alterations (even after it leaves the artist’s ownership). The second components are patrimonial rights, the economic rights that give the author a right of property that allows him to benefit financially from his work. Unlike moral rights, economic rights are limited in time and are transferable. Antoine Defoort will dwell on this concept of the remuneration of artists to further explain the relationship of these rights to the heirs and the rights holders that seem to benefit from them more that the artists. He illustrates this idea with the quite wild “Maurice Ravel case” (developed below). This idea of artist’s remuneration is then reconsidered in the light of the internet. In this era in which we all assist to an ongoing media revolution, the mechanisms of protection for intellectual property need to be redesigned. The traditional economical model for “intangible” artworks such as movies, books, songs… was based on the sale of a physical support, making a non-rival resource (the creation in itself) become a rival resource (“if a take one there’s one less left” meaning that the book has to be printed on paper, the song has to be burned on a CD…) and therefore permitting its financial exploitation. However, the internet made the, once mandatory, use of a physical support pretty much obsolete, therefore giving free access to potentially all immaterial creative work. This considerably damaged the traditional mechanisms for the protection of author’s rights. Antoine Defoort then ends its performance by questioning the global conception of author’s remuneration and gives us a glimpse on the emerging new ways of remuneration of this new era such as the creative commons, crowd funding (Kickstarter and Patreon for instance), global licence… We can already witness the changing form of author’s remuneration with platforms such as Netflix, Spotify… that seem to have found a middle ground between unlimited access and creators earning. This superb representation and its loads of examples, illustrations and funny anecdotes inspired us to approach this matter with our own cases, helping us understand the complex relations between the artwork in itself and the author’s rights, financial exploitation, economic rights and legislations. After having re-examined the Ravel case, we’ll further study two other examples: “Le Petit Prince”, which illustrates the need for a harmonization of European IP laws, and “Mickey Mouse”, that gives us the opportunity to examine the influence of lobbying in this domain. The first step of our analysis is the Maurice Ravel case, which is the nexus of the theatre play of the November 22. He is one of the best-known French composers (1875-1937). The Bolero is the piece of music he is most famous for; he also wrote, most notably: “Valses nobles et sentimentales”, “Habanera”, “Jeux d’eau”, “Pavane pour une infante défunte” and several concertos for piano (for a biography and a full list of his creations, see here and here). Even though his Bolero finally fell into the public domain on April 30, 2016 (this doesn’t concern the heir’s moral right which is perpetual and untransferable in France), the artistic legacy of Ravel has known a very complicated path, which marked the history of the “droit d’auteur” in France (here). We would not want to spoil the pleasure of “Un faible degré d’originalité”, but let us quickly expose how the Bolero’s term of protection was determined. First, the French “Lang” statute (1985) lengthened the protection of the “droits d’auteur” from 50 to 70 years post-mortem. Secondly, the prorogation linked to WWII – 8 years and 120 days – must be added to the scheme, for all pieces of music that were published for the first time between January the 1st, 1921 and December 31, 1947. Thirdly, we must combine a European directive from October 29, 1993 (aiming at the harmonization of the term of copyright and certain related rights, see here) and two decisions from February 27, 2007 delivered by the French “Cour de Cassation” (on the accumulation of the 70 years protection and the War-time prorogation). Adding it all up, the result is 78 years and 120 days after the 1st of January of the year following the death of the composer: April 30, 2016. To make things easier, this does not apply to all of Ravel’s compositions… What interests us most is the role of Jean-Manuel Scarano and Jack Lang, then Minister for Culture in France. The latter gave his name to a statute of July 3, 1985, allegedly in order to better protect artistic production in France (going from 50 to 70 years after the death of the artist). It seems, however, that the lawmakers may have had other interests at heart. Jean-Manuel Scarano was producer and CEO at the Durant editions; he met with members of the parliamentary commission in charge of the statute and pushed for its adoption, increasing by doing so his own benefits on Ravel’s pieces (from which he owned shares) – resulting in several millions of euros! Ravel’s extraordinary musical productions thus played a significant role in the development of the “droits d’auteur” in France. We now want to focus on one case that illustrates the paradox created by the disparity of intellectual property laws in Europe. It concerns the literary work “Le petit prince” written by the well-known French author Antoine de Saint-Exupéry. According to E.U. law, copyrighted creations become part of the public domain 70 years after the death of their author, but E.U. countries are allowed to implement exceptions. This is the case with the French copyright law: if a French author is “mort pour la France” which means that the author is dead on a war field fighting for the protection of the French nation interests, there is a prorogation of his property rights for a duration of 30 years that are simply added to the 70 years of protection that all authors already benefit after their death (here). But this prorogation of 30 years only applies on the French territory. One can now easily imagine the problem that occurred: as Antoine de Saint-Exupéry died in 1944, it means that on January 1, 2015 (70 years after his death), “Le petit prince” has become part of the public domain all around Europe except in France. This paradox leads to a situation in which all European citizens can freely access “Le petit prince” without paying a single penny, except the compatriots of Saint-Exupéry who still have to wait another 30 years in order to enjoy this freedom (in fact, it is a bit less but the calculation is so complicated that we suggest you discover it on the following website. A concrete illustration of this paradox is the Belgian website “saintexupery-domainepublic.be” which proposes free PDF version of the work but with a sarcastic comment directed to French readers who are prevented by their national laws to access it: proposition number 1: “Cross the border to Belgium, where you will have all rights to benefit from the freedom of the public domain” or proposition number 2: “Revisit the website in 30 years. Au plaisir de vous revoir” (here). The losers of this situation are the French citizens. One last question needs to be asked: « cui bono ? ». Well, those property rights are detained by two different clans: the nephews and great-grand-nephews because Saint-Exupéry didn’t have children; and we have on the other side José Martinez who was the gardener and driver of Saint-Exupéry’s widow. Does all of this remind you someone? Yes, you get it: our beloved Maurice Ravel! Let’s now move on to America. Another really interesting story relates to the adoption of the U.S. Copyright Term Extension Act 1998. Everyone knows that Mickey Mouse is a fictional character that was created in 1928 by the famous Walt Disney. As every original work, the little mouse was considered as protected by copyright since its creation. At the time of its first projection, the duration of protection was of 56 years (post-mortem) as it was laid down by the U.S. Copyright Act of 1909. What is somewhat interesting to analyse is the evolution of the copyright duration. Studying the application and the formal content of a norm is certainly a substantive part of the role of the lawyer. Nonetheless, what is proposed hereafter is to go futher and try to give a modest interpretation of the reasons that led to the adoption of these laws. As already mentioned it, when the end of the protection is reached, the work falls into what is called the public domain, permitting anyone to use it for its own publication without having to pay anything nor to receive an authorization of the author. Pluto’s owner was hence subject to this. But since the cartoon character was Disney’s most popular and became literally the public ambassador of the company, it was a bit difficult for the company to let the little mouse fall into the hands of others. Therefore the company tried to find out how to “monopolize” the character and to keep it cozy in their bosom. At this particular moment, it was “no-holds-barred, free for all” and they began to lobby in order to adapt the legislation. The Copyright Act of 1976 extended the protection from 56 to 75 years. Some would say that Disney was behind this change in the law but the reason of this extension was probably not linked with it. Without excluding the potential involvement of Disney, it seems that it was indeed an international necessity more than the fruit of a possible lobby. Note that the 1976 Copyright Act allowed the protection to be applied only to the works that were created after 1922, including thus Mickey Mouse. The context of the adoption of the legislation that further changed the duration is more subject to controversy. In 1998, the «Sony Bono Copyright Extension Act» extended the duration of protection from 75 to 95 years. 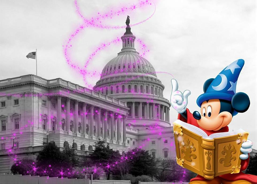 Contrary to the first case of 1976 in which Disney’ hand was not involved, here, it’s a proven fact that the company lobbied actively Congress for its adoption. But how? Simply by financing directly the campaign of the politicians that would consider the bill favourably once elected. Among the 25 Congressman and senators that voted for the adoption of the law, 19 received a campaign contribution from Disney. It seems that Disney’s objectives were eventually attained on the cheap as, in total, the PAC (Disney Political Action Committee) only paid $149.612 (here and here). It should be mentioned also that only one Congressman (Senator Hank Brown) spoke out about that fact, which, when you think about it, is worrying. 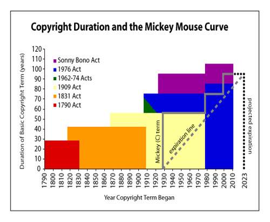 The graph hereafter shows that Mickey Mouse’s life evolves in parallel with the protections that are legally accorded. Obviously, those secret manoeuvres (the company remains totally silent) have been criticized. For instance, Dan O’Neil, a famous American artist, criticized Disney by using Mickey Mouse’s character in some drawing boards. He was sued by the firm and asked to pay an amount of $200.000. This shows how strong the link is between the company and its friendly character and how far it can go (it is not a singular example). The Supreme Court of the United States was asked to determine whether this extension of the copyright duration was compatible with the terms of the U.S. Constitution. According to the Constitution, the protection is valid only “for a limited amount of time”, but since the duration was extended to 95 years, one could discuss whether such duration was still limited. The SCOTUS answered in 2003 that, because of the crucial role of copyright, the Congress was entitled to adopt such type of legislation and to extend the duration of protection. Again, Mickey Mouse won. According to the priceonomics website, there are three arguments that are systematically raised to defend those extensions. (1) The necessary incentive of creation by promoting protection, (2) that it’s allowing a lot of income both for the artists and for the states and finally, (3) since human life is also extending thanks to medical improvements, artworks should enjoy longer protection so as to benefit two generations of heirs. 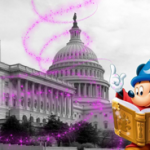 Undoubtedly, Mickey Mouse will always be a good reason for Disney to lobby and influence the legislation to reach its corporate interests. Maybe, someday, the mouse will finally be freed? No one knows. But its gaoler will not let it slip through its fingers without a fight! In all those different cases we were able to see how particular interests tend to shape IP law and bend it to their needs. Especially when these interests emanate from media industry powerhouses (such as Disney) that capitalize on their IP as the bedrock of their corporate destiny. The examined cases illustrate the fluid relationship between IP law and its content. Whether it is about old laws that don’t really make sense anymore or lobbies pushing to enforce their interests, IP law is shaped by the conflicts between the creators it aims to protect, the big corporations whose power depend on it and the larger public who is sometimes struggling to understand its relevance. It’s an ever-changing matter because it needs to adapt to the racing technological pace but also to the increasingly intertwined national legislations. It is always interesting to analyse day to day examples of this phenomenon, it helps us to understand IP law in a more entertaining way. Nowadays, with the ongoing revolution brought by the internet, IP law is going to be a determining factor in the future of Culture, which is why a better understanding of its mechanisms is crucial in order to allow for a fruitful blossoming of ideas. Note: All the images that weren’t referenced were found on Pixabay.com and released under Creative Commons CC0.